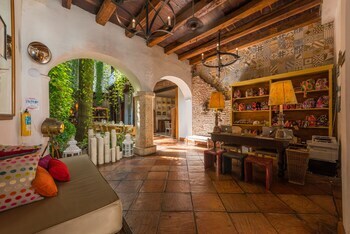 Located in Cartagena (Cartagena Walled City), Bantu Hotel By Faranda Boutique is within a 10-minute walk of Puerta del Reloj and San Pedro Claver Church and Convent. Featured amenities include a 24-hour front desk, multilingual staff, and luggage storage. Located in Aguachica, Hotel Calle Real is a 5-minute drive from San Vicente de Paul Church and 5 minutes from Maria Eugenia Athletic Fields. Free self parking is available onsite. When you stay at MonteMadero Casa Hotel in Cota, you'll be 14 minutes by car from Biopark La Reserva. The front desk is staffed during limited hours. Free self parking is available onsite.